This article is about the fictional character. For the animated being from Jewish folklore, see Golem. For other uses, see Gollum (disambiguation). "Smeagol" redirects here. For the sea slug, see Smeagol (gastropod). For Smeargle, see List of generation II Pokémon § Smeargle. Gollum is a fictional character from J. R. R. Tolkien's legendarium. He was introduced in the 1937 fantasy novel The Hobbit, and became an important character in its sequel, The Lord of the Rings. Gollum was a Stoor Hobbit of the River-folk, who lived near the Gladden Fields. Originally known as Sméagol, he was corrupted by the One Ring and later named Gollum after his habit of making "a horrible swallowing noise in his throat". In Appendix F of The Lord of the Rings, the name Sméagol is said to be a "translation" of the actual Middle-earth name Trahald (having to do with the idea of "burrowing", and rendered with a name based on Old English smygel of similar meaning). Several critics speculate that Beowulf's Grendel could have been an inspiration for Gollum due to the many parallels between them – such as their affinity for water, their isolation from society due to personal choices, and their bestial description. Although Tolkien never explicitly stated this, he accredited Beowulf as one of his "most valued sources" when writing The Hobbit. The Ring, which Gollum referred to as "my precious" or "precious", extended his life far beyond natural limits. Centuries of the Ring's influence twisted Gollum's body and mind, and, by the time of the novels, he "loved and hated [the Ring], just as he loved and hated himself." Throughout the story, Gollum was torn between his lust for the Ring and his desire to be free of it. Bilbo Baggins found the Ring and took it for his own, and Gollum afterwards pursued it for the rest of his life. Gollum finally seized the Ring from Frodo Baggins at the Cracks of Doom in Orodruin in Mordor, but he fell into the fires of the volcano, where both he and the Ring were destroyed. Gollum was first introduced in the Hobbit as "a small, slimy creature" who lived on a small island in the centre of an underground lake at the roots of the Misty Mountains. He survived on cave fish, which he caught from his small boat, and small goblins who strayed too far from the stronghold of the Great Goblin. Over the years, his eyes adapted to the dark and became "lamp-like", shining with a sickly pale light. Bilbo Baggins stumbled upon Gollum's lair, having found the Ring in the network of goblin tunnels leading down to the lake. At his wits' end in the dark, Bilbo agreed to a riddle game with Gollum on the chance of being shown the way out of the mountains. In the first edition of The Hobbit, Gollum's size is not stated. Only in the revised version is it specified that he is small and is actually an unnaturally long-lived Hobbit. Originally he was also characterized as being less bound to the Ring than in later versions; he offered to give the Ring to Bilbo if he lost the riddle game, and he showed Bilbo the way out of the mountains after losing. To fit the concept of the ruling Ring that emerged during the writing of The Lord of the Rings, Tolkien revised later editions of The Hobbit: The version of the story given in the first edition became the lie that Bilbo made up to justify his possession of the Ring to the Dwarves and Gandalf. In the new version Gollum pretended that he would show Bilbo the way out if he lost the riddle-game, but he actually planned to use the Ring to kill and eat the hobbit. Discovering the Ring missing, he suddenly realized the answer to Bilbo's last riddle��– "What have I got in my pocket?" – and flew into a rage. Bilbo inadvertently discovered the Ring's power of invisibility as he fled, allowing him to follow Gollum undetected to a back entrance of the caves. Gollum was convinced that Bilbo knew the way out all along, and hoped to intercept him near the entrance, lest the goblins apprehend Bilbo and find the Ring. Bilbo at first thought to kill Gollum in order to escape, but was overcome with pity, and so merely leaped over him. As Bilbo escaped, Gollum cried out, "Thief, Thief, Thief! Baggins! We hates it, we hates it, we hates it forever!" The Fellowship of the Ring, the first volume of The Lord of the Rings, explains that Gollum's real name was Sméagol, and he had once been a member of the secluded branch of the early Stoorish Hobbits. He spent the early years of his life with his extended family under a matriarch, his grandmother. On Sméagol's birthday, he and his relative Déagol went fishing in the Gladden Fields north of Lothlórien. There, Déagol found the Ring in the riverbed after being pulled into the water by a fish. Sméagol fell immediately under the Ring's influence and demanded it as a birthday present; when Déagol refused, Sméagol strangled him. Sméagol later used the Ring for thieving, spying and antagonizing his friends and relatives, who nicknamed him "Gollum" for the swallowing noise he made in his throat, until his grandmother expelled him from the family. He wandered in the wilderness for a few years until he finally retreated to a deep cavern in the Misty Mountains. The Ring's malignant influence twisted his body and mind, and prolonged his life well beyond its natural limits. Gollum left his cave in pursuit of Bilbo a few years after losing the Ring, but the trail was cold. He made his way to the edge of Mordor, where he met the monstrous spider Shelob and became her spy, worshiping her and bringing her food. He was eventually captured by Sauron's forces and tortured, revealing to Sauron the names of "Baggins" and "the Shire". His testimony alerted the Dark Lord of Mordor to the existence and significance of Hobbits in general and the Baggins family in particular. He was freed, but was soon caught by Gandalf and Aragorn, who interrogated him about the Ring and placed him in the care of the Wood Elves of Mirkwood. He escaped them (with the help of Sauron's Orcs) and descended into Moria. Gollum picked up the trail and began following the Fellowship of the Ring in Moria, only to be spotted or heard by Frodo Baggins (younger cousin and heir of Bilbo, as well as the Bearer of the Ring), Gandalf, and Aragorn on several occasions. Gollum continued trailing the Fellowship to the edge of Lórien. Gollum began trailing them again as they left and followed them all the way to Rauros, then pursued Frodo and Samwise Gamgee across the Emyn Muil when they struck out on their own towards Mordor. In The Two Towers, Frodo and Sam confronted Gollum in the Emyn Muil; Gollum nearly strangled Sam, but Frodo subdued him with his Elvish sword, Sting, which had once belonged to Bilbo. Frodo tied an Elvish rope around Gollum's ankle as a leash, but the mere touch of the rope pained him. Taking pity on the wretched creature, just as Bilbo once had, Frodo made Gollum swear to help them. Agreeing to the oath, Gollum swore by the "precious" itself, and Frodo released him. The unlikely company, guided by Gollum, made their way to the Black Gate, the main entrance to Mordor. Frodo's kindness brought out Gollum's better nature, and he made at least some effort to keep his promise. Sam, however, despised Gollum upon sight, and often warned Frodo of the creature's deception and slipperiness. When they reached the Black Gate and found it well-guarded, Gollum offered to lead them toward an alternate entrance into Mordor. Along the way, Frodo and Sam were seized by Faramir, and Gollum slipped away uncaught (but not unseen) and followed them. When Frodo allowed Faramir to briefly take Gollum prisoner in order to spare his life, Gollum felt betrayed, and began plotting against his new "master". Faramir found out that Gollum was taking them to Cirith Ungol, and warned Frodo and Sam of the evil of that place, as well as the treachery he sensed in Gollum. Frodo, Sam, and Gollum left Faramir and began climbing the stairs to Cirith Ungol in the border-mountains of the Ephel Dúath. Gollum slipped away and visited Shelob, planning to feed the Hobbits to her and then get the Ring for himself when she was done. When he returned, he found the Hobbits asleep, and the sight of Frodo sleeping nearly moved Gollum to repent. However, Sam woke up and spoke harshly to him, and the opportunity for redemption was lost. Gollum followed through with his plan and led Frodo and Sam into Shelob's Lair. There, Frodo was stung by the giant spider, taken prisoner by Orcs, and hauled to the Tower of Cirith Ungol. In The Return of the King, Sam single-handedly rescued Frodo from Cirith Ungol and, dressed in scavenged Orc-armour, the two began to make their way across the plateau of Gorgoroth. They finally arrived, against all odds, at Mount Doom, the only place where the Ring could be destroyed. However, Gollum had secretly followed them all the way, seeking a chance to surprise them and take the Ring. When Frodo and Sam had almost reached their destination, Gollum attacked them, but Frodo threw him down. Sam faced Gollum on his own, letting Frodo continue up the mountain to finish their mission. Like Bilbo and Frodo before him, Sam spared Gollum's life out of pity, and turned his back on the beaten (but still wily) creature and followed Frodo. Moments later, Frodo stood on the edge of the Crack of Doom, but was unwilling to destroy the Ring, claiming it for himself and putting it on. Gollum struck again, and struggled with the invisible Frodo. Finally, Gollum bit off Frodo's finger and seized the Ring. He gloated over his "prize", dancing madly, but stepped over the edge and fell into the lava, taking the Ring with him with a last cry of "Precious!" Thus, the Ring was destroyed and Sauron defeated. Sam cursed Gollum after his death, but Frodo urged his friend to forgive him, as without him the quest would have failed and the War of the Ring would have been lost. Tolkien later wrote that it was direct intervention by Eru Ilúvatar, Middle-earth's version of God, that led to Gollum's "accident". In the first edition of The Hobbit Tolkien made no reference to Gollum's size, leading several illustrators to portray him as being very large. Tolkien realized the omission, and clarified in later editions that Gollum was of average Hobbit size. The Lord of the Rings characterizes him as slightly larger than Samwise Gamgee. Tolkien describes Gollum as either dark, bone-white or sallow; at one point the Men of Ithilien mistake his silhouette seen from a distance for that of a tailless black squirrel. In a manuscript written to guide illustrators to the appearance of his characters, Tolkien explained this by saying that Gollum had pale skin, but wore dark clothes and was often seen in poor light. The Hobbit states he has pockets, in which he keeps a tooth-sharpening-rock, goblin teeth, wet shells, and a scrap of bat wing. The Hobbit describes him as thin, with only six teeth sharpened into points. Comparing him to Shelob, one of the Orcs describes him as "rather like a spider himself, or perhaps like a starved frog." Gollum is described as "a small slimy creature" (in The Hobbit), and emaciated and gaunt, but possessing a vicious, wiry strength. In The Fellowship of the Ring, Aragorn states "his malice gives him a strength hardly to be imagined." In The Two Towers, Gollum's grip is described as "soft, but horribly strong" as he wrestles with Sam. Gollum hated everything Elf-made. In The Two Towers, Sam bound Gollum's leg with Elven rope, which caused Gollum excruciating pain by its mere presence. He was also unable or unwilling to eat the lembas bread Sam and Frodo carried with them. A 2004 scientific study by the University College London argued that Gollum meets seven of the nine diagnostic criteria for schizoid personality disorder. Gollum speaks in an idiosyncratic manner, often referring to himself in the third person, and frequently talks to himself. When not referring to himself in third person, he sometimes speaks of himself in the plural as "we", hinting at his split personality. The rare occasions when he actually says "I" are interpreted by Frodo as an indication that Sméagol's better self has the upper hand. Gollum also uses his own versions of words similar to the original words. He usually adds -es to the end of a plural, resulting in words such as "hobbitses" instead of hobbits, "Bagginses" instead of Baggins, or "birdses" instead of birds. When forming the present tense of verbs, he frequently extends the third person singular ending -s to other persons and numbers, resulting in constructions like "we hates it" (by analogy with "he hates it"). In general, Gollum is represented as very fond of sibilants, often drawing them out. Within Tolkien's larger scheme, English in the books represents the Westron or Common Tongue of Middle-earth. Gollum is thus understood to have spoken Westron in a non-standard way, which is then translated as non-standard English. Since he is often described as hissing, the fondness for sibilants was apparently an actual feature of his idiosyncratic Westron. Due to the influence of the One Ring, Gollum's life was extended far beyond that of other members of his clan. An average Hobbit lifespan is over 100 years, but a span of 556 years separates Gollum's finding of the Ring in T.A. 2463 and its destruction in T.A. 3019, by which time he would have been approaching an age of 600 years. Gollum was voiced and performed by Andy Serkis in Peter Jackson's live-action version of The Lord of the Rings. In the Rankin/Bass adaptations of The Hobbit (1977) and The Return of the King (1980), Gollum appears as a frog-like creature with large, lamp-like eyes. His voice is provided by Brother Theodore. Despite Tolkien's description, Gollum is portrayed as almost naked, save for a loin-cloth. 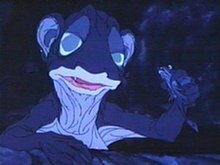 In Ralph Bakshi's animated film adaptation of The Lord of the Rings (1978), the voice of Gollum was supplied by Peter Woodthorpe, who also reprised the role in the BBC's 1981 radio serial. In the Soviet-era television film Сказочное путешествие мистера Бильбо Бэггинса, Хоббита (The Fairytale Journey of Mr. Bilbo Baggins, The Hobbit), Gollum is portrayed by Igor Dmitriev. Kari Väänänen portrayed Gollum (Finnish: Klonkku) in the 1993 live-action television miniseries Hobitit [The Hobbits] that was produced and broadcast by the Finnish network Yle. In Peter Jackson's The Lord of the Rings film trilogy, Gollum is a CGI character voiced and performed by actor Andy Serkis. He is smaller than both Frodo and Sam. Barely glimpsed in The Lord of the Rings: The Fellowship of the Ring (2001), he becomes a central character in The Lord of the Rings: The Two Towers (2002) and The Lord of the Rings: The Return of the King (2003). The CGI character was built around Serkis' facial features, voice, and acting choices. Serkis based the iconic "gollum" throat noise on the sound of his cat coughing up hairballs. Using a digital puppet created by Jason Schleifer and Bay Raitt at Weta Digital, animators created Gollum's performance using a mixture of motion capture data recorded from Serkis and the traditional animation process of Key frame, along with the laborious process of digitally rotoscoping Serkis' image and replacing it with the digital Gollum's in a technique coined rotoanimation. This work required a large number of digital artists. As in the animated depictions of the character, Gollum is shown as virtually naked save for a loincloth in the trilogy. In Jackson's films, Gollum has a split personality: the childlike "Sméagol" and the evil "Gollum". Screenwriters Fran Walsh and Philippa Boyens included scenes in The Two Towers, The Return of the King and An Unexpected Journey in which "Gollum" and "Sméagol" argue, with Serkis slightly altering his voice and body language to play the two as separate entities. His dual personality was also emphasized by different pupil dilation – "Gollum" has small, piercing pupils and "Sméagol" larger, noticeably dilated pupils – and by positioning the two on different sides of the screen. Serkis and Gollum appeared on the 2003 MTV Movie Awards, when Gollum won "Best Virtual Performance" and went on to deliver an obscenity-laden acceptance speech in character. The speech itself was so well received that it won the Hugo Award for Best Dramatic Presentation, Short Form. This clip can be found as an easter egg in The Two Towers DVD. Wizard Magazine rated Jackson's Gollum as the 62nd greatest villain of all time, from among 100 villains from film, television, comics and video games. In addition, Serkis as Gollum was placed thirteenth on Empire's "100 Greatest Movie Characters of all Time". He was also ranked the Number 1 pick in the Watchmojo.com Top 10 lists of "Motion Capture Performances" and "Villains Destroyed by the Power they Sought". Serkis once again played Gollum in the prequel film The Hobbit: An Unexpected Journey, released in 2012. In the film, Gollum drops the Ring while killing a goblin, rather than having lost the Ring by the time Bilbo finds it. Gollum also appears in The Hunt for Gollum, the independently-produced 2009 prequel to the Jackson films directed by Chris Bouchard. Bouchard's CGI Gollum is directly inspired by Gollum in the Jackson films. Gollum is referenced in the song "Ramble On" by Led Zeppelin on their 1969 album Led Zeppelin II. In the 2011 film Attack the Block, the invading aliens are referred to as "gollums." In the Hobbit video game by Vivendi Universal, released in 2003, Gollum appears in one cutscene depicting the scene in which he and Bilbo play the riddle game before Gollum discovers that Bilbo has the Ring and inadvertently leads Bilbo out of the Misty Mountains. He also appears in Electronic Arts' games based on the Jackson films. In the real-time strategy game The Lord of the Rings: The Battle for Middle-earth, Gollum is a playable hero unit for Mordor. In its sequel, The Lord of the Rings: The Battle for Middle-earth II, which is also based on the film series, he is not playable. Instead, he walks around the map cloaked, carrying the Ring. When killed, he drops the Ring for a player to claim. When the Ring is returned to the player's fortress, they may summon a special "Ring Hero" – Galadriel for good factions and Sauron for evil. He also appears in the action game The Lord of the Rings: The Return of the King (based on the 2003 film), voiced by Andy Serkis. He is an NPC who accompanies Frodo and Sam (the player) as the game progresses, but at Mount Doom becomes the final boss, whom the player must throw into the lava below. In the Game Boy version of The Return of the King, he is a playable bonus character. He appears in the video game Middle-Earth: Shadow of Mordor, voiced by Liam O'Brien. A Lego minifig version of Gollum, in his design from Andy Serkis' character, is playable in Lego The Lord of the Rings, (with archive voice dialogues of Andy Serkis), where he also serves as the final boss, and in Lego Dimensions. His abilities include acrobatic skills and a boomerang fish. Liam O'Brien reprises the voice role. A new species of cave-dwelling harvestmen first described in 2015 was named Iandumoema smeagol in reference to Gollum. A genus of small sea slugs was named Smeagol in reference to the original name of the Tolkien character. The genus contains five species of air-breathing sea slugs which live in inter-tidal zones in the shores of New Zealand and Australia. Daedalic Entertainment are currently developing a video game about Gollum. In 2014, Turkish physician Bilgin Çiftçi shared an image comparing Turkish President Recep Tayyip Erdoğan to Gollum. As a result of administrative investigation, he was expelled from service. In 2015, Erdoğan sued Çiftçi for insulting him, demanding he serve two years in prison. The court started an investigation to determine if comparing someone with Gollum is offensive. Peter Jackson, the producer/director of the movie adaptations, defended the pictures and said all these pictures are actually "Sméagol", not the evil Gollum. Jackson expanded on the difference, saying that "Sméagol is a joyful, sweet, character. Sméagol does not lie, deceive, or attempt to manipulate others. He is not evil, conniving, or malicious – these personality traits belong to Gollum, who should never be confused with Sméagol. Sméagol would never dream of wielding power over those weaker than himself. He is not a bully. In fact, he is very loveable." Elijah Wood, who portrayed Frodo in Jackson's films, called the incident "horrifying". ^ "Gollum". Lord of the Rings Fantasy World. Retrieved 28 November 2010. ^ Nelson, Brent (2008). "Cain-Leviathan Typology in Gollum and Grendel". Extrapolation. Liverpool, England: University of Liverpool. 49 (3): 466. doi:10.3828/extr.2008.49.3.8. ^ Tolkien, J.R.R. (1981). Carpenter, Humphrey; Tolkien, Christopher (eds.). The Letters of J. R. R. Tolkien. Boston, Massachusetts: Houghton Mifflin. p. 141. ISBN 0-04-826005-3. ^ "Books by J.R.R.Tolkien - The Hobbit - Editions". Tolkien Library. Retrieved 26 March 2019. ^ Loos, William D.B. "V. A. Tolkien And His Work". The Tolkien Frequently Asked Questions List. Retrieved 27 March 2019. ^ Tolkien, J.R.R. (1988). "Riddles in the Dark". In Anderson, Douglas (ed.). The Annotated Hobbit. Boston, Massachusetts: Houghton Mifflin. ISBN 978-0618134700. ^ Bashir, Nadia; Ahmed, Nadia; Singh, Anushka; Tang, Yen Zhi; Young, Maria; Abba, Amina; Sampson, Elizabeth L. (2004). "A precious case from Middle Earth". The BMJ. London, England: British Medical Association. 329 (7480): 1435–1436. PMC 535969. ^ "Sméagol". The Encyclopedia of Arda. Retrieved 25 March 2015. ^ Serkis, Andy (2003). Gollum: How We Made Movie Magic. London: Harper Collins. p. 4. ISBN 0-618-39104-5. ^ The Lord of the Rings: The Two Towers – Special Extended DVD Edition, The Appendices Part Three: The Journey Continues (DVD). New Line Cinema. 2002. ^ "2004 Hugo Awards". The Hugo Awards. Archived from the original on 7 May 2011. Retrieved 10 April 2014. ^ "13. Gollum". Empire Online. London, England: Bauer Media Group. Retrieved 4 December 2010. ^ Winning, Josh (7 April 2011). "Andy Serkis Will Direct The Hobbit's second unit". Total Film. Bath, Somerset, England: Future Publishing. Retrieved 25 June 2018. ^ Pinto-da-Rocha, Ricardo; Fonseca-Ferreira, Rafael; Bichuette, Maria Elina (18 November 2015). "A new highly specialized cave harvestman from Brazil and the first blind species of the genus: Iandumoema smeagol sp. n. (Arachnida, Opiliones, Gonyleptidae)". ZooKeys. Sofia, Bulgaria: Pensoft Publishers (537): 79–95. doi:10.3897/zookeys.537.6073. PMC 4714048. PMID 26798238. ^ Tillier, S.; Ponder, W. F. (1992). "New species of Smeagol from Australia and New Zealand, with discussion of the affinities of the genus (Gastropoda: Pulmonata)". Journal of Molluscan Studies. London, England: Malacological Society of London. 58 (2): 135–155. doi:10.1093/mollus/58.2.135. ^ Shanley, Patrick (25 March 2019). "'Lord of the Rings: Gollum' Video Game in the Works From German Studio Daedalic". The Hollywood Reporter. Retrieved 25 March 2019. ^ "Erdoğan'a hakarette 'Gollum' cezası: Doktor memuriyetten men edildi". Diken. Retrieved 12 December 2015. ^ Barnett, David (4 December 2015). "Is being compared to Gollum the ultimate insult... or precious praise?". The Guardian. London, England: Guardian Media Group. Retrieved 6 December 2015. ^ Denham, Jess. "Is Gollum good or bad? Peter Jackson wades into Turkish court debate after judge demands character assessment". The Independent. London, England: Independent Print Ltd. Retrieved 4 December 2015. ^ Shaheen, Kareem (4 December 2015). "Erdoğan's 'Gollum insult' a mistake, says Lord of the Rings director". The Guardian. London, England: Guardian Media Group. Retrieved 6 December 2015. ^ Blair, Olivia (3 December 2015). "Elijah Wood wades into Turkish court investigation into whether comparing President Erdoğan to Gollum is offensive". The Independent. London, England: Independent Print Ltd. Retrieved 4 December 2015. Wikimedia Commons has media related to Gollum (Middle-earth). Look up Gollum in Wiktionary, the free dictionary. Wikivoyage has a travel guide for Gollum.